One Day Design takes your existing pieces and reworks them to make your space feel fresh and appealing. An objective eye can see the potential in your home in a way that you may not be able to anymore. This service is ideal for anyone moving into a new space, couples who are moving in together or anyone who wants their home to truly reflect their style. 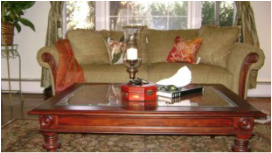 I'll edit and rearrange your existing items and offer suggestions to help complete your space. I can provide a list of items (including sources) or you can take advantage of CSD's personal shopping service. There is a $100 fee (one hour) for your initial consultation. Rates for One Day Design start at $250.